Gullies on Mars that are shaped as though carved by recently flowing water. Small gullies on Mars were carved by water recently and would be prime locations to look for life, NASA scientists said today. There have been many studies of Martian gullies that concluded water was involved. But most of the features are ancient, or if they seemed modern then there were questions about how the water could stay liquid long enough to do the carving. Scientists know there is a lot of water ice on Mars, locked up at the poles and beneath the surface elsewhere. Water is a key ingredient for life as we know it, and other scientists have speculated that life on Mars, if there is any, could lurk just beneath the surface where ice melts in pockets. The new study suggests water may still bubble to the surface of Mars now and then, flow for a short stretch, then boil away in the thin, cold air. The conclusion is based on computer modeling of the atmosphere and how water would behave. "The gullies may be sites of near-surface water on present-day Mars and should be considered as prime astrobiological target sites for future exploration," said Jennifer Heldmann, the lead researcher from NASA's Ames Research Center. "The gully sites may also be of prime importance for human exploration of Mars because they may represent locations of relatively near surface liquid water, which can be accessed by crews drilling on the red planet." Any potential long-term human presence on Mars would require a water source, both for drinking and to be broken down into hydrogen as fuel for return flights. 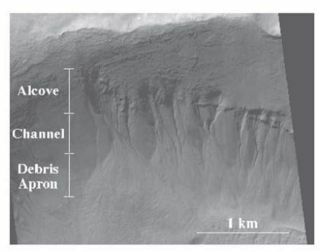 The claim that water carved the gullies is based on the shape and size of features spotted by NASA's Mars Global Surveyor. "If liquid water pops out onto Mars' surface, it can create short gullies about 550-yards (500-meters) long," Heldmann said in a statement. "We find that the short length of the gully features implies they did form under conditions similar to those on present-day Mars, with simultaneous freezing and rapid evaporation of nearly pure liquid water." Some of the gullies taper off into very small debris fields or leave no debris at all. That implies the water rapidly froze or evaporated. Given the low air pressure on Mars, water would boil in a flash, the researchers say, so it is doubtful that ice accumulates in the gullies. The findings will be presented next month at a meeting of the American Astronomical Society's Division for Planetary Sciences in Cambridge, England.